The new Disability Leadership Institute will support, develop and promote leaders with disabilities. The Institute will provide an ongoing program of resources, training and connections so that the largest minority group in the world today assumes its rightful place as 15% of leaders across all fields of society. The Institute has been established by Christina Ryan and other lleaders with disabilities in consultation with leaders with disabilities It is time to change the way leadership is understood. You can become a member or join the National Register of Disability Leaders. WDV is looking for an experienced Gender Equity Program Manager to oversee the third phase of WDV's Gender and Disability Workforce Development Program. The position is for 6 months (and may be extended pending funding). The closing date for applications has been extended to Wed 19th October at 5pm. Inquiries can be made by phoning Dee Henry on 9286 7800 (Monday to Thursday). Are you a young person aged 16-25 and living with a disability? Would you like to take part in research about young people’s safety? The Centre for Children and Young People would like to invite you to talk about what safety means to you, what helps, and what else needs to happen for all young people to be safe. Meaghan and the research team are visiting Melbourne in November to talk with young people individually or in groups. Register to take part in the research. If you would prefer an interview rather than coming to a group, a time can be set up for you. If you would like to know more, contact Meaghan: PHONE (02) 66203062 or email meaghan.vosz@scu.edu.au. “Our Right to Respect” is a program that runs for 4 weeks in November. WDV would like to invite women to be part of this program which will run in Ringwood. This is run by women with disabilities for women with disabilities. RSVP and CONTACT: Bianca Evans on 92867809 or via email Bianca.Evans@wdv.org.au. The scale of discrimination and violence experienced by women with disabilities has been highlighted in the recent Victorian Royal Commission into Family Violence and the Parliamentary Inquiry into Abuse in Disability Services. Disability organisations are critical in addressing gender and disability inequality and preventing violence against women before it occurs. How your organisation can differentiate itself as an NDIS provider who delivers gender sensitive and responsive services and is active in preventing violence against women. Organisational leaders and managers are encouraged to attend this timely workshop. RSVP: By 28 October 2016 to Bianca Evans, E:bianca.evans@wdv.org.au or T: (03) 9286 7809. - Concluding with the Launch of the Simply Hear Me The Personal is Political Art Exhibition. 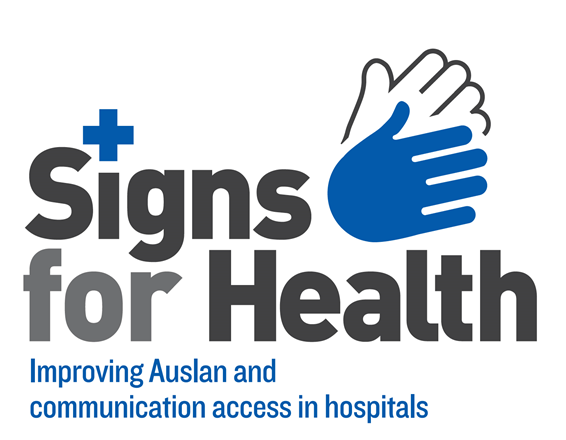 Signs for Health is a resource to improve Auslan and communication access for people who are deaf, hard of hearing or deaf/blind. It has been developed by Victoria's Human Rights Commission. Signs for Health will launch during the National Week of Deaf People (15–21 October) and to contribute to improving access to health services for Victorians who are deaf, hard of hearing or deafblind. Details about transport options, taxi rank and parking. RSVP: By Wednesday 12 October 2016 to communications@veohrc.vic.gov.au. Please advise if you have any dietary or accessibility requirements, including interpreter or hearing loop requirements. Deafblind Victorians Invite You to a FREE PROFESSIONAL DEVELOPMENT TRAINING FOR THE DEAF COMMUNITY. Deafblind Victorians (DBV) is an advocacy and self advocacy group run by people who are deafblind and people with Ushers. DBV provides a workshop for organisations and the wider community to educate people about deafblindness. * What is Ushers syndrome and deafblindnes? * Methods of communication and guiding techniques. Time: 3.30 pm to 5.30 pm. (please arrive 10 minutes before workshop start time). RSVP: Before Wednesday 12 October 2016 to deafblindadvocacy@gmail.com. Limit 20 participants. Interpreters are provided so please let them know whether you are deaf or hearing. SARU would like to invite you to.The Dangerous Deeds exhibition. Dangerous Deeds is an Accessible Video Exhibition with 8 screens // captioned // audio described // text read. It is a 'snapshot' of the Victorian disability movement created by stART Community Arts and Victorian disability activists. Dangerous Deeds presents a unique perspective on disability culture and insights into aspects of Victoria’s social and cultural history. The Great Hall, Council Offices 25 Ferres Blvd, South Morang. - // The Future will be Inclusive: Art//Design//Access. See the Dangerous Deeds Facebook page for more details. Family Planning Victoria will focus on the theme, 'Increasing capacity, access and choice for abortion care in Victoria. ' 7pm, Tuesday 25 October 2016 at , Family Planning Victoria, 901 Whitehorse Road, Box Hill. RSVP Tel: (03) 9257 0128, Email: ea-ceo@fpv.org.au. "We know that one size does not fit all when it comes to preventing violence against women and the conference explored the tailored actions that can help address the inequality, disadvantage and violence faced by women with disabilities, women from culturally and linguistically diverse communities, and the LGBTIQ community." Jen from WDV joined a number of women with disabilities who attended the conference. She spoke on two panels - one looking at 'intersectionality' and the other looking at running programs in under-resourced areas. One of the most important things about the conference for WDV was the way it brought different groups together - allowing us to be different and to explore what we have in common in ending violence. and promote gender equality in disability services. The Program is funded by the Victorian government to promote cultural change across whole organisations, working with clients, staff, managers and executives. Program funding was extended by the Victorian Government after the successful piloting of the program with two disability organisations during 2013-2015 and an independent program evaluation. 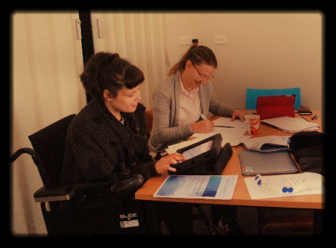 WDV have recruited seven women with disabilities to undertake the co-facilitator apprenticeship train the trainer program. WDV enthusiastically welcome on board Larissa MacFarlane; Michelle Wilcox; Robyn Wright; Step Tipping; Vildana Praljak; Tracey McGeehan; and Sharon Sellick who collectively have a diversity of lived and professional experience. WDV has formed partnerships with women’s health services and centres against sexual assault to contribute their staff to undertake the co-facilitator apprenticeship train the trainer program. We thank our partners and welcome on board Annie Douglas (Women’s Health in the North); Lauren Temminghoff (Women’s Health West); Kimberly Batsas-Hill & Tracey Egan (Women’s Health in South East); and Cara Hammond & Wendy Miller (South East CASA). All new recruits have been inducted will watch the two day disability support worker training in action before they start delivering the training. Michelle Wilcox and Annie Douglas (in picture below) and Stef Tipping went along to a recent two day training for Scope disability support workers (facilitated by veteran co-facilitators) to observe and reflect on the content and facilitation and what it means for their co-facilitation. As training continues to be scheduled all new recruits will get an opportunity to observe the training prior to commencing a two day train the trainer workshop and finally co-facilitating their own training with WDV support in preparation for taking first flight. 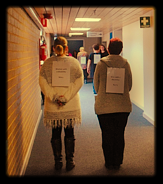 A Picture Paints a Thousand Words: Gender and Disability Workshops on the move! The Program kicked off in early July with a half day “Human Rights & Quality Services: What does gender have to do with it?” leadership workshop delivered to 27 executive, senior and middle managers of the Wesley Mission Victoria leadership team including CEO, Paul Linossier. 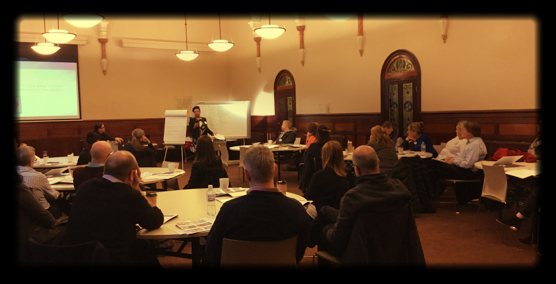 PHOTO: Abigail Sullivan (Women's Legal Services Victoria) and Colleen Furlanetto (Mayor of Strathbogie Shire) co-facilitating the Wesley Mission Victoria leadership workshop. With values such as hope, compassion and justice the Wesley Mission Victoria Leadership team launched into an activity called Stepping Up. Co-facilitated by Colleen Furlanetto and Abigail Sullivan, the activity illustrates in the most potent way, the social and economic disadvantages that women with disabilities can face in a world where gender and disability inequality is rife. As four volunteers take on the role of either a women with or without a disability, a man with or without a disability and line up in the middle of The Chapel room at McKillop Family Services in South Melbourne, Colleen provides instructions on the activity. Co-facilitators Colleen and Abigail and participant onlookers watch as the volunteers in their roles moved back and forth until the gap between each volunteer becomes glaringly apparent. Colleen asks participants to reflect on what has transpired and the reason for the disparity in positions. “This shows the divide between men and women without disabilities and those with a disability particularly women” one participant said. Other responses included, “Things need to change” and “I will be more mindful of the experiences of women with a disability”. Language, gender and disability roles and stereotypes as well as media representation were also explored in the workshop with participants commenting on the value of this session and what actions they would take as a result. The Scope leadership workshop set the scene for the success of 2 day workshops co-facilitated by Eva Sifis and Dagmar Jenkins for two groups of Scope disability support workers from the East. Participants overwhelmingly rated the workshops as good to very good with a common response being, “Enlightening, it really opened my eyes. I will never look at things in the same way.” (Scope disability support worker). "I will spread the word to people working in other organisations about the value of the workshop"
Workshops will continue to roll out in the next few months to Wesley Mission Victoria, coordinators and direct support staff and with other disability support providers. Detailed updates on WDV's workforce development program and other activities to end violence against women with disabilities are available through our Violence Quarterly email - you can subscribe online.